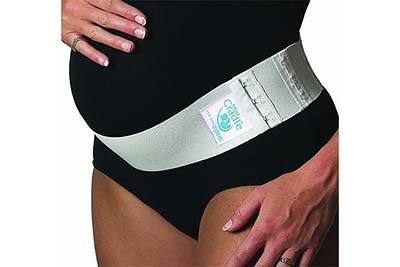 Your maternity belt features 3 sets of hook and eye closures to ensure a comfortable fit. The hook and eye fasteners are constructed to avoid catching on clothing, enabling the Mini Cradle to remain smooth, snug and flexible. Back pain, Abdominal and Hip strain, Umbilical hernia. Can easily be positioned higher or lower on abdomen for maximum support or placed to support umbilical hernia. Mini Cradle is designed to be worn under clothing. Wrap the cradle around and under your abdomen and secure into place with the hook and eye clasps for snug fit. You should not feel ‘squashed’ into the Mini Cradle. It is designed to smoothly lift and support without compression. Adjust garment support band up and down for more or less support as needed. Cradle does not need to be removed for bathroom breaks. We always recommend that you speak with your doctor when experiencing pain during pregnancy.